The first VP Fair was a three-day event, held July 3-5, 1981. With just six months planning time and a tiny budget,  it was a miniature version of what would be presented during the rest of the 1980s. Country singer Loretta Lynn was scheduled as the fair's major entertainment, but in a precursor of things to come, was rained out that evening. The rain also swamped the river barge loaded with fireworks, but Sunday night's fireworks, still dry, were substituted and enjoyed by all on the 4th. 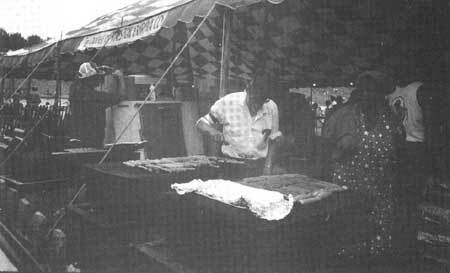 Food and craft booth, VP Fair, July 4, 1981. NPS photo. More than four million people, the VP Fair's largest crowd of the decade, attended the 1983 fair. 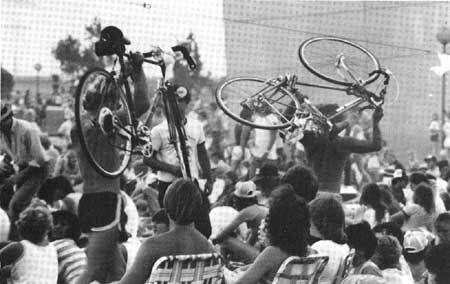 Several new attractions were added, including ten satellite music stages scattered about the grounds, a hot air balloon race, an air show, the VP Fair Criterium bicycle races at Busch Stadium and the first annual VP Fair Run. The theme of the fair was "St. Louis . . . Great Moments in Fantasy." A tightrope artist walked a wire between the Clarion Hotel and the KMOX Radio building, at a height of 300 feet, for a distance of three blocks. This, of course, was off park property. Perhaps the most unusual event of the fair was a wedding held in Luther Ely Smith Square, between the Arch Grounds and the Old Courthouse. A VP Fair band entertained an expectant crowd who waited for the bride, 30 minutes late in arriving. Booth vendors from the fair supplied ice cream and cake for the wedding party, including the 90-year-old justice of the peace. 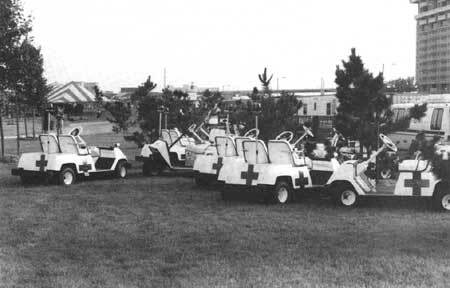 Emergency carts on the Gateway Arch grounds, for use during the VP Fair. Courtesy John Weddle. Visits totalling 3.95 million were made during the 1985 VP Fair, which was extended to a four-day extravaganza. This was made possible because the 4th of July fell on a Thursday. The fair's featured entertainment was purposely steered away from rock music and toward more family-oriented attractions. These included Ray Charles, Doc Severinsen with the St. Louis Symphony Orchestra, Liza Minnelli, and Up With People. Other family features included a "Fun Fair Village," a "Country Western Fair" and a historic look at baseball sponsored by Famous-Barr, KMOX Radio, and Schnuck's Markets. Stunt pilot Art Scholl was a hit during McDonnell-Douglas' daily air show. The 1985 Fair was also able to attract out-of-town corporate sponsors such as Chrysler Corporation, which hosted an Auto Fair. 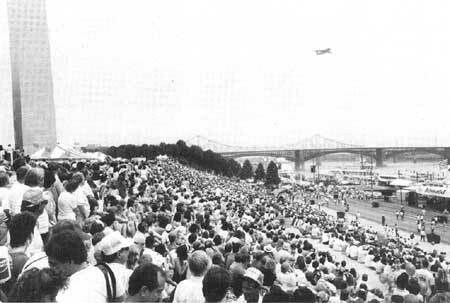 Crowds watch the McDonnell-Douglas Air Show, 1985 VP Fair. NPS photo by Al Bilger. Executive Director Charles Wallace estimated a profit of $300,000 for the 1985 fair, "almost equal to its total profit during the first four years. "The reason, he said, is the families. Superintendent Schober agreed to sign a special use permit for four more VP Fairs, with the understanding that the fair would be cut from four days to three, and that the Park Service would no longer fund the extra rangers on the special event teams. SCHOBER SAID he asked Congress this year for the roughly $130,000 needed to pay for the 40 extra rangers, who help local police and fair security guards control the huge crowds. The money was classified as an emergency expenditure for law enforcement, he said. This funding was covered by the VP Fair Foundation in subsequent years. As more than 200,000 expectant fans awaited the arrival of Dolly Parton on the main stage Saturday, July 5, they paid little attention to a security truck slowly motoring through the reluctantly parting masses. As the truck entered the maintenance tunnel, Ms. Parton, crouching in the back of the vehicle, was able to come out of her uncomfortable position. Moments later, after being successfully spirited onto the grounds, she appeared on the main stage to a tremendous ovation. Crowds wait for a featured performer on the main stage at the VP Fair. Photo by John Weddle. A police officer shot and wounded a youth about 10:50 p.m. Saturday when the youth pulled a tear-gas gun from his pants and pointed it at [the] officer. . . . Police were trying to break up a fight at the time, and most of those who were involved fled when the shots were fired. . . .
On Friday night, a bystander was shot in the leg during another scuffle. Another man also was reported to have been shot, but police said they had not found him. . . They said groups of young people ranging in age from 12 to their early 20s and ranging in size from five people to 40 people, had moved through the crowds, stealing gold chains, purses and other valuables from fairgoers. "It's nauseating," said an officer . . . "We're not able to protect these people, that's the bottom line." The 1987 VP Fair was a three-day event with the theme "We, The People," honoring the bicentennial of the U.S. Constitution. Former Chief Justice of the United States Warren E. Burger served as honorary chairman. A special "Constitutional Village," sponsored by the Bar Association of Metropolitan St. Louis and St. Louis County, was established within the fairgrounds. The fair opened with the conclusion of the first-ever U.S. National Senior Olympics, a week-long event which included 2,500 athletes aged 55 and older. Bob Hope hosted the closing ceremonies of the Senior Olympics and the opening ceremonies of the VP Fair. Hope and his wife Dolores also served as grand marshals of the VP Parade. Advance planning for the 1988 VP Fair culminated in the donation of $85,000 to cover National Park Service participation. Hotel accommodations and air travel were donated. "'I feel my appointment and the other appointments really represent a beginning,' Hylton said. 'You have to make certain that the black community is represented in the structure of the VP Fair on all levels. The VP Foundation's promise to remedy the absence of blacks from its executive body and from many fair activities marks a good first step toward improving the image of its Independence Day event. The foundation has pledged to begin an ad campaign to boost black attendance at the fair and set up a permanent committee to help assure black participation. The proposed changes are welcome, even if they are overdue. It's no exaggeration to say the lily-white legacy out of which the fair grew has remained disturbing to many blacks. The onus for bridging this racial chasm had to be on fair organizers, and they have made a good start by abandoning the outdated notion that all they needed to attract blacks was to give them some stage time for gospel music. The 1989 fair was the first to be broadcast to audiences worldwide over the Voice of America Radio Network. Twelve Voice of America reporters, fluent in eight languages, interviewed fairgoers and described the events. A massive naturalization ceremony was conducted on July 3, as 150 people gathered at the South Overlook. These immigrants, representing 54 countries, simultaneously took the oath of allegiance and generated international publicity for the park and the event. 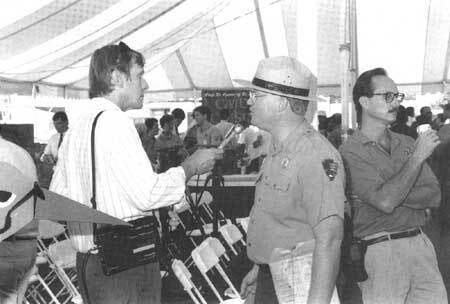 National Park Service information tent at the VP Fair, 1990; Chief of Museum Services and Interpretation Mark Engler speaks to the press. NPS photo by Al Bilger. 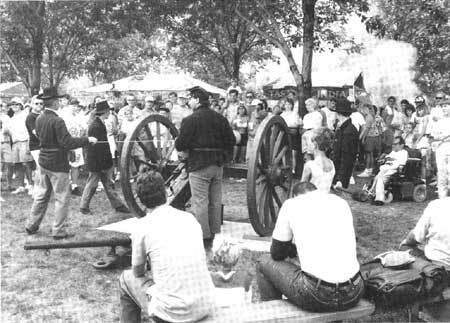 NPS cannon crew at the 1990 VP Fair. NPS photo by Al Bilger. Duane Gruis went to the VP Fair last year and had no trouble getting around or seeing everything he wanted to see. He had such a good time, he's going back this year. Gruis uses a wheelchair, and he is urging other would-be fairgoers who use wheelchairs to attend the fair, which begins Friday and runs through Monday on the grounds of the Gateway Arch. "They'll have a good time," said Gruis, who is an independent-living specialist with Paraquad, Inc.
Gruis said that he did not attend the fair until last year. "It wasn't hard to do. I knew where the reserved parking spaces were, and I got to the fairgrounds without any trouble. And I saw just about everything I wanted to see." He said that the large number of concrete walkways had made it easy to get around in a wheelchair and that accessible restrooms had been in the disabled services tent. 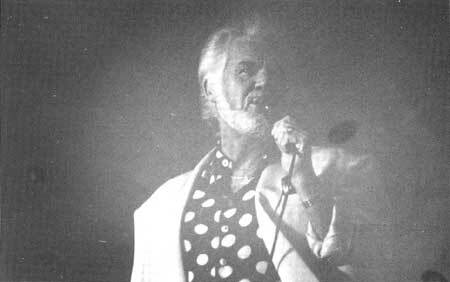 Kenny Rogers was rained out at the 1991 VP Fair, but performed in 1992. NPS photo by Al Bilger. All last week we read about controversy surrounding the VP Fair, but not much was said about the day provided for the elderly. The ballroom of the Clarion Hotel was made available along with coffee, cookies, popcorn, punch . . . and a full day of entertainment. Sudden, violent thunderstorms forced the early closing of the fair at 2:40 p.m. on Monday, the final day of the festivities. The fireworks finale and the performance of Kenny Rogers were canceled.